GET GREAT ABS - Here is a good tip for if you want nice abs... don't do ab workouts UNTIL after you've lost weight. The problem with ab workouts is that they build muscle, they don't really burn that many calories. To burn calories what you need to do is cardio. Running, jogging, swimming, cycling, jumping jacks, aerobics and so forth. Anything where your whole body is moving for a long period of time. That burns calories fast. Ab Workouts like the video below only come into play when you've already lost the weight and have actual abs to brag about. Then you switch from cardio to ab workouts (or balance the two) in an effort to build muscle tone. Looking for some New Years Resolutions that will help you lose weight? #1. Stop buying sugary food / junk food / unnecessary snacks. Buy fruit and berries instead. 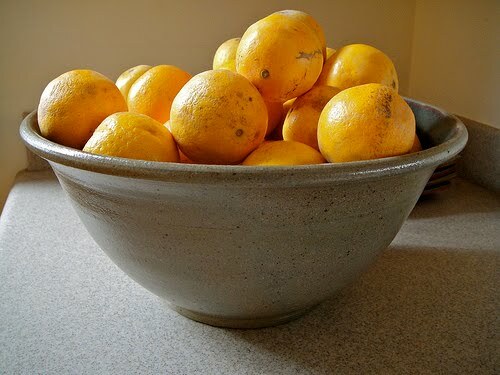 A bowl of oranges on the counter will encourage you to eat healthier whenever you feel like a snack. #3. Bored? Exercise! Waiting in a lineup or stuck in traffic? Waiting for a friend to meet you? Do simple exercises or yoga postures while you wait. #4. Find an exercise hobby that is fun that you can do regularly. ie. Archery, mountain biking, wall climbing, parkour or freerunning. #5. Think Positive! Having a positive outlook on life (not just health wise) helps. Depressed people are more lethargic and crave comfort foods. Forcing yourself to be positive about your circumstances and always looking on the bright side will actually help you lose weight because you won't be so depressed and seeking comfort all the time. #6. Stop worrying about every last bit of fat. Your goal is to be healthy, not starved. A little fat is good. #7. Posture! Sit up, walk straight with your shoulders high, don't slouch. Good posture helps your digestion and boosts core muscle strength. Over time your posture will improve and you will look taller / thinner and feel better about yourself. #8. Take up public speaking. Losing weight is often about confidence. If you're afraid of public speaking you suffer from low confidence. Join Toastmasters International and similar public speaking clubs and boost your confidence levels. #9. Eat slowly, savour your food and come up for air. You won't feel as hungry and won't eat as much. Eating junk food very quickly = fast weight gain. SLOW DOWN AND ENJOY. #11. Exercise every day even when you don't feel like it. Try and make it fun by using music or fun activities and over time it won't feel like a chore any more. #12. Got a beer belly? Cut down on your alcohol consumption. Alcoholic drinks like beer has lots of carbs just like bread. Cut out the unnecessary beer and you will lose weight (and look waaaay sexier!). If you spend 5 minutes every day doing vigorous sit ups you will burn approx. 48 to 60 calories per day depending on your weight. If your weight is 160 lbs, 48 calories. If your weight is 180 lbs, 54 calories. If your weight is 200 lbs, 60 calories. The interesting thing is that if you do this every day for a month those calories add up. Anywhere from 1440 to 1800 calories. When you consider that there is 3500 calories in 1 lb. of body fat it makes you realize what a little 5 minute exercise can do over a period of a year. That 5 minutes over 365 days adds up to 5 to 6 lbs. Now imagine instead of 5 minutes you did something else... like jog a mile every day for a year. Jogging a Mile = 105 calories if you weigh 160 lbs. 118 calories if you weigh 180 lbs. 131 calories if you weight 200 lbs. The end result is jogging a mile daily burns 11 to 14 lbs of fat per year. A mile isn't really that far either. The average person can jog a mile in 10 minutes easily. NOW IMAGINE DOING BOTH! Do sit ups for 5 minutes then go for a 10 minute jog every day. That will burn 16 to 20 lbs of fat per year. Combined with a balanced diet and you will have a body that many people would envy. #1. Try more Fun Exercises that get you outdoors. eg. Archery! #2. Go jogging / cycling in the morning or after work daily. #3. Exercise for 30 minutes every day. #4. Make a daily exercise routine that is fun and you enjoy doing. #5. Get an exercise partner and make exercise part of your socialization. #6. Join a sports group / club so you can exercise and socialize at the same time. #7. Take up a winter sport. eg. Road Hockey. #8. Take up a summer activity. eg. Snorkeling. #9. Keep a daily log of your physical activity (and your eating habits). Counting calories doubles your chances of success. #10. Take up weightlifting and build strength / endurance. #11. Stay motivated to exercise all year round by rewarding yourself every 20th time you exercise. #12. Hire a Personal Trainer - Not just to help motivate you, but also to help you exercise more efficiently and challenge yourself to achieve your goals. The chart below shows the amounts of weight that actor Christian Bale loses and gains depending on the role he is playing... including the incredibly 109 lbs he gained in six months after portraying The Machinist in order to prepare for his role in Batman Begins... he got so big that he ended up losing 19 lbs in the last month to "downsize" himself to play Batman because the producers thought he had beefed up too much for the role. Yo-yo dieting is a way of life for some people, but when it comes to Hollywood actors gaining and losing lots of weight is sometimes part of the job. But it certainly helps when they have access to some of the most expensive personal trainers available in the USA. Another big difference between Hollywood actors and ordinary people is the amount of free time they have. Free time to consult with personal trainers, nutritionists and doctors. And abundant free time to exercise, lift weights and do cardio training. Lets stop and do some math. Christian Bale gained 109 lbs in 6 months. That is an average gain of 18.17 lbs per month. Granted a small portion of it was probably fat tissue, but most of it was muscle so he would look beefy for the Batman role. To be gaining 18.17 lbs per month he would need to be gaining an average of 0.6 lbs per day he would need to be consuming approx. 270 grams of protein per day. To put that in perspective 10 scoops of Six Star Muscle Professional Strength Whey Protein contains 260 grams of protein - And the recommended maximum daily usage is only 6 scoops (2 scoops three times per day). And to be fair he would need other things to do. Lots of vitamins, nutrients, minerals, fruits and veggies. And perhaps most importantly, sodium, because sweating causes the body to lose sweat. And lastly carbs and sugar, for energy. Because how else would he be able to exercise that much and put on so much muscle in an hurry? According to sources Bale was going to the gym 6 days per week for 3 hours per day (18 hours per week) to prepare for the film American Pyscho in 2000. Presumably he must have been following a similar or more intense program to prepare for Batman Begins. Well there is one trick to this... Muscle Memory. People who lose muscle and then later gain it back can bounce back faster because their body remembers the muscle being there. And since Christian Bale lost muscle to play The Machinist it was easier for him to gain it back while eating himself back up to his normal weight. In contrast people are not regaining muscle will find it very difficult to gain new muscle because the body has no memory of it. Just the way it works. There are other factors too, like age, metabolism, hormone levels, bone structure and diet. Diet can be managed via nutrition, and metabolism can be improved through the combination of diet and hormones like testosterone... but bone structure basically gives you a set maximum for how much muscle you can pile on. Eventually you reach a physical limit wherein you can't get any bigger because your frame can't handle any more. Many ordinary people struggle to lose weight and struggle even harder to gain muscle mass. On the first topic Christian Bale lost 63 lbs to play The Machinist (121 lbs and anorexic), but how did he do it? Starvation, vitamins and lots of cardio. He basically burned away the fat and muscle by doing lots of cardio while simultaneously starving himself. As part of the process, Bale consulted a nutritionist who advised him about how much weight he should safely lose — but Bale kept going past that point. “I lost another 20 pounds below what she said I should stop at,” says Bale. 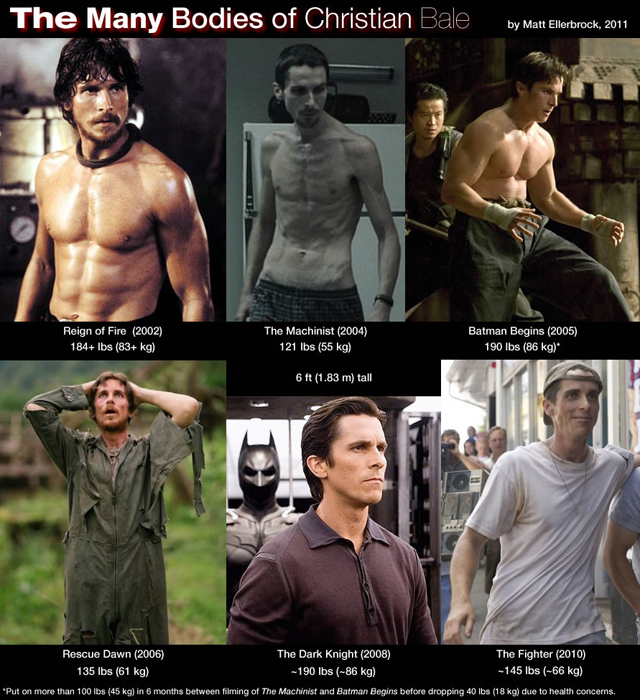 After The Machinist, Bale hired a personal trainer to help him gain 100 pounds (45 kg) in the span of only 6 months to prepare for the role of Batman in 2005. He ended up gaining 109 lbs, almost doubling his weight, and once he had reached 210 lbs he lost 20 lbs because he ended up looking too beefy. His extra large physique was not appropriate for Batman, who relies more on speed and strategy. I should also note that it isn't healthy or good for your heart to create these kinds of huge weight fluctuations. It can cause a person to get holes in their heart and cause a heart attack. People who are new to weightlifting can gain up 20 lbs of muscle in a hurry. This is known as "Newbie Gains". Another way to gain muscle is Muscle Memory, but that only works if you have a history of weightlifting and used to have a lot more muscle. This is more common amongst athletes who suffer an injury and then bounce back to full strength after a long rest. A larger bone structure and genetics helps too, especially if your body produces lots of hormones that help build muscle (like testosterone). The last and final thing is steroids. Which is banned amongst athletes and very commonly used by professional bodybuilders. Steroids causes a slew of health problems however, including problems with liver, heart and even shrinks the testicles. It robs other body parts of needed energy and nutrients and funnels it towards muscle growth instead. So what is the lesson from all of this? Yes, you can gain muscle in a hurry if you want to... 2 lbs per month is certainly within the safety limits and doable if you exercise and lift weights for an hour or two daily. And if you're doing that then you need to be eating approx. 900 grams of protein per month on top of your regular diet. Which is a little over a scoop of Six Star Muscle Whey Protein per day. Lastly if you do decide to do this, you need to know how to weigh yourself properly. #1. Assuming you are pretty regular always measure your weight after you urinate and do your "Number 2" for the day. #2. Wear the same clothes (or no clothes at all) every time you weigh yourself. #3. Keep a chart and record your weight fluctuations daily. If you're not gaining weight and seeing noticable changes in your muscles then you need to be lifting more weights and challenging yourself more. You may even need to hire a personal trainer to make certain you are getting the best possible results. If you want to add lots of muscle to your frame you're going to need to start with the basics... Researching Bodybuilding Techniques! You need to become a guru on the topic. To be fair you are probably starting off as a complete novice, so you need all the advice you can get. So the best tip I can give you if want to Do-It-Yourself is to visit your local library and start checking out books on bodybuilding. This way you get access to the books and they don't cost you a cent. If you go to bookstores and buy all of these books its going to cost you a lot of moolah... And some of the books might be complete nonsense and not very helpful. So if you start off with your local library you can get a lot of information in a hurry without it costing you a cent. So yeah, worth the walk to the library. Or better yet, jog there. But to be fair there are plenty of other books out there for you to choose from. 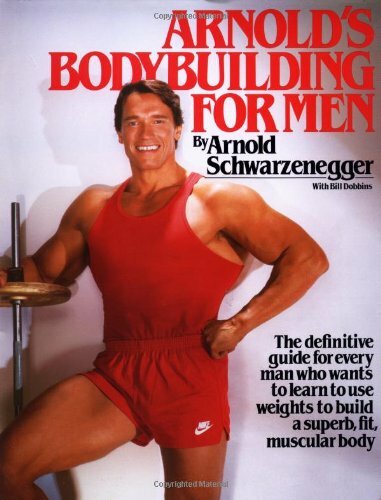 The Toronto Public Library has 173 books just on the topic of bodybuilding. Another thing you should do, in addition to research, is to get a complete physical with your family doctor. Then make a point of asking if they have any words of caution regarding bodybuilding and the kind of stress you will be putting your body through. Ask about protein supplements, muscle relaxants / painkillers, Creatine, common sports injuries and if you have any health concerns. Remember no pain no gain... so it doesn't hurt to learn more about muscle relaxers. The video playlist below is an interview with Sylvester Stallone talking about how Rocky was made.